We describe a case of a 40-year-old male patient who reported to the dental specialty clinic with the chief complaint of discomfort and pus discharge from his mandibular left lateral incisor, which he had experienced since last few months. 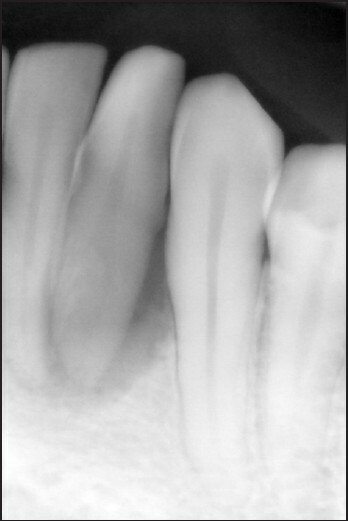 On intraoral examination, loss of stippling and draining sinus was observed in the attached gingiva with respect to 32. Periodontal probing depths were measured using a William's graduated periodontal probe with increased probing depth suggesting localized periodontitis. Electric pulp test and cold test were performed to check for tooth vitality with a negative response, which confirmed that the tooth was non-vital. 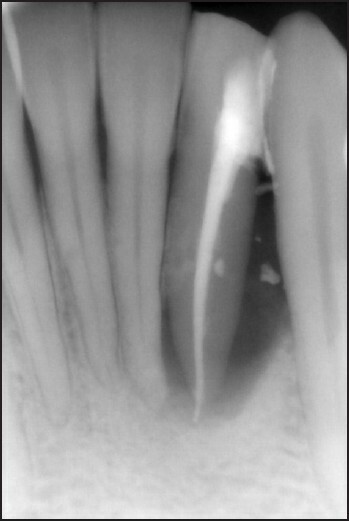 On radiographic examination, peri-apical radiograph showed radiolucency involving the periapical area with radiolucency extending to the lateral surface of the root [Figure 1]. A diagnosis of endodontic-periodontal lesion was established and classified according to Grossman's classification 1988  as a primary endodontic lesion with secondary periodontal involvement in relation to 32. Treatment planning was done taking into consideration that the tooth was non-vital along with concurrent periodontal lesion. Subgingival scaling was performed. 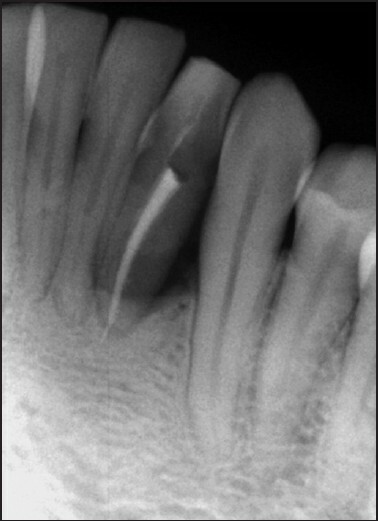 Access cavity was prepared in relation to 32 using endo access bur (Dentsply Tulsa Dental specialties; Tulsa, Oklahoma). Cleaning and shaping of the canals was done by crown-down approach using ProTaper - Universal rotary files (Dentsply Maillefer, Ballaigues, Switzerland) with 5.25% of sodium hypochlorite irrigation. Canal disinfection was done using laser with 200 μm optical fiber (Kavo Gentleray 980 Diode Laser). The canal was dressed with calcium hydroxide (UltraCal XS; Ultradent, South Jordan, UT, USA) as intracanal medicament and access cavities were sealed with intermediate restorative material cement. New attachment procedure was performed on the same appointment using a 980 nm Diode laser with optical fiber thickness 300 μm. The laser was aligned exactly parallel to the root and the entire interior of pocket was brushed with the distal end of optical fiber at 1-1.5 W power, which completed debridement of the pocket, hemostasis was achieved and created a soft clot and a closed system. The tissue was compressed against the root surface for about 1-2 min to close the pocket and stabilize the fibrin clot. No graft was placed. Occlusion was checked. Post-operative instructions were given to the patient with proper plaque control and 0.12% of chlorhexidine mouthwash for rinsing twice a day. Patient was recalled after 2 days. The absence of pain or signs of inflammation indicated that the root canal treatment could be completed. Obturation was done using Gutta-percha and AH Plus sealer (De Trey-Dentsply, Konstanz, Germany). 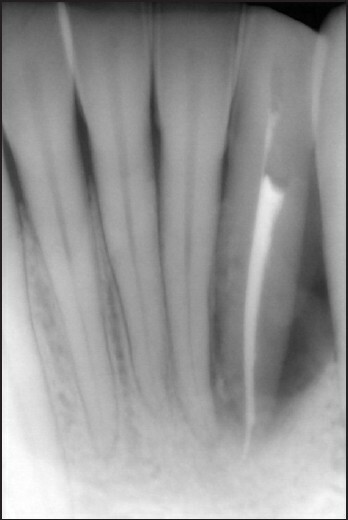 Access cavity was restored using a high strength glass ionomer restoration [Figure 2]. Patient was recalled for 1 month [Figure 3], 1 year [Figure 4] followed by yearly follow-up [Figure 5]. At 1 month recall, patient was asymptomatic with healed sinus tract. Periodontal probing showed pocket depth within physiological limits as measured by a Williams graduated periodontal probe. Peri-apical radiograph after 4 years follow-up revealed increased apical density indicating healing [Figure 6]. Based on the above study it can be concluded that endo-perio lesions always possess a challenge to the clinician for correct diagnosis and treatment planning. Although there may be difficulties in establishing a correct diagnosis, this is the most important phase of their management as this will determine the type and sequence of treatment required. Soft-tissue diode laser is more effective and less traumatic than conventional surgical methods. In this case, both endodontic and periodontal treatments were carried out in the same appointment resulting in shorter chair side time. This line of treatment with the biostimulating properties of lasers may hold better prospects of treating similar endodontic periodontal lesions more predictably in a shorter time. 1. Simring M, Goldberg M. The pulpal pocket approach. Retrograde periodontitis. J Periodontol 1964;35:22-48. 2. Zehnder M, Gold SI, Hasselgren G. Pathologic interactions in pulpal and periodontal tissues. J Clin Periodontol 2002;29:663-71. 3. Simon JH, Glick DH, Frank AL. The relationship of endodontic-periodontic lesions. J Periodontol 1972;43:202-8. 4. Kimura Y, Wilder-Smith P, Matsumoto K. Lasers in endodontics: A review. Int Endod J 2000;33:173-85. 5. Solomon C, Chalfin H, Kellert M, Weseley P. The endodontic-periodontal lesion: A rational approach to treatment. J Am Dent Assoc 1995;126:473-9. 6. Hegde MN. Text Book of Endodontics. 1 st edition, EMMESS Medical Publisher; 2009. Bangalore. 7. Abbott PV, Salgado JC. Strategies for the endodontic management of concurrent endodontic and periodontal diseases. Aust Dent J 2009;54 Suppl 1:S70-85. 8. Abbott P. Endodontic management of combined endodontic periodontal lesions. J N Z SocPeriodontol 1998; 83:15-28. 9. Verma PK, Srivastava R, Gupta KK, Srivastava A. Combined endodontic-periodontal lesion: A clinical dilemma. JID 2011; 1(2):119-24. 10. Chen SY, Wang HL, Glickman GN. The influence of endodontic treatment upon periodontal wound healing. J Clin Periodontol 1997;24:449-56. 11. Shetty K, Hegde MN, Shetty S. Comparative evaluation of bacteriocidal effects on E. Faecalis using Diode laser irradiation, sodium hypochlorite, chlorhexidine irrigation - an in vitro study. Journal of OHDM (in press). 12. Saunders WP, Whitters CJ, Strang R, Moseley H, Payne AP, McGadey J. The effect of an Nd-YAG pulsed laser on the cleaning of the root canal and the formation of a fused apical plug. Int Endod J 1995;28:213-20. 13. Yamazaki R, Goya C, Yu DG, Kimura Y, Matsumoto K. Effects of erbium, chromium:YSGG laser irradiation on root canal walls: A scanning electron microscopic and thermographic study. J Endod 2001;27:9-12. 14. Takeda FH, Harashima T, Kimura Y, Matsumoto K. Efficacy of Er:YAG laser irradiation in removing debris and smear layer on root canal walls. J Endod 1998;24:548-51. 15. Kotlow LA. Lasers in pediatric dentistry. 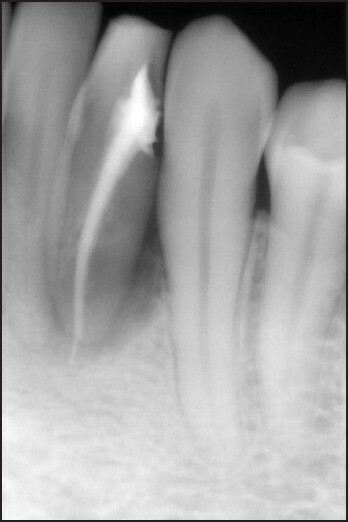 Dent Clin North Am 2004;48:889-922. 16. Hegde MN, Hegde ND, Nagesh SC. Lasers in management of endo-perio lesion - A case report. AOSR 2011;1(4):215-18.